This is more than a road trip—it’s an adventure! Follow a route along many of Norway’s top attractions, including the stunning fjords, the central highlands and picture-perfect towns like Bergen, Trondheim and Røros. You’ll encounter waterfalls, glaciers, UNESCO World Heritage sites, hair-raising mountain roads and dramatic coastlines all in one road trip. From Geilo, you will continue the journey to Bergen. The drive will take you past the Hardangervidda National Park to the inner parts of the beautiful Hardangerfjord, with its spectacular views. 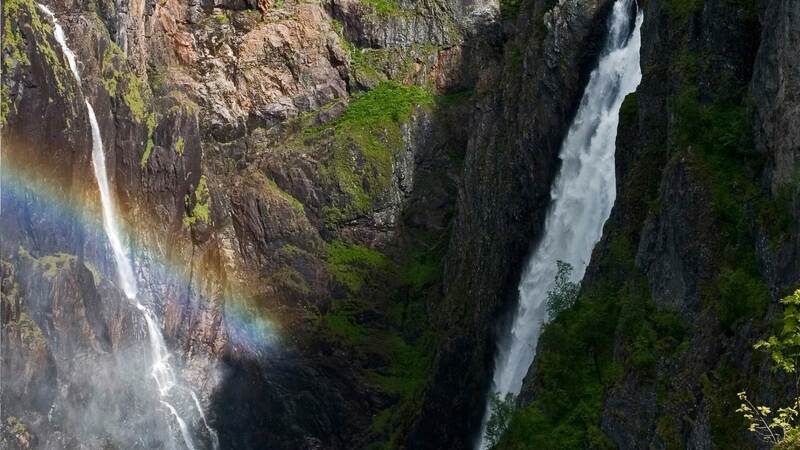 On your way, you will pass such highlights as the impressive waterfall, Vøringfossen —the highest in Norway, with a 182-metre cascade—and the dramatic and narrow Måbødalen valley, along Eidfjord. The day starts in Bergen, which is a wonderful city, full of life and culture. In this “must-visit” city, you will find Bryggen, listed by Unesco as a World Heritage site; exceptional old houses; a vibrant fish and flower market; cable cars offering stunning views; great museums; dynamic culture, and more. 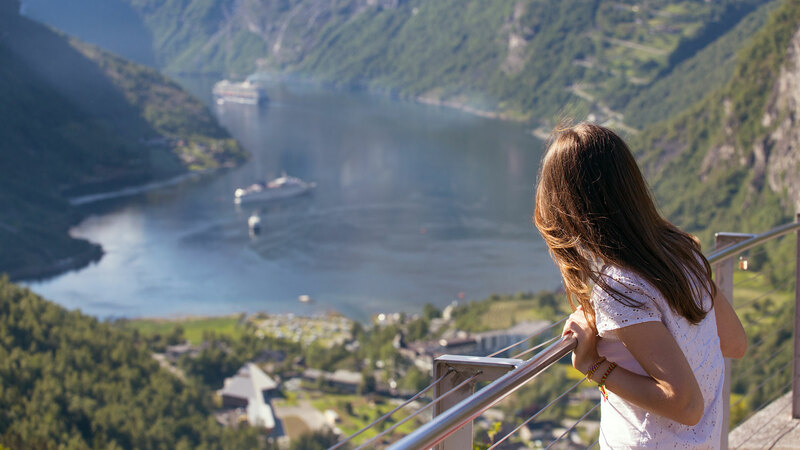 From Bergen, your journey will continue as you head on to the Sognefjorden—Norway’s longest and deepest fjord—passing such highlights as the towns of Stalheim, Voss and Flåm before reaching Sogndal, your final destination for the day. 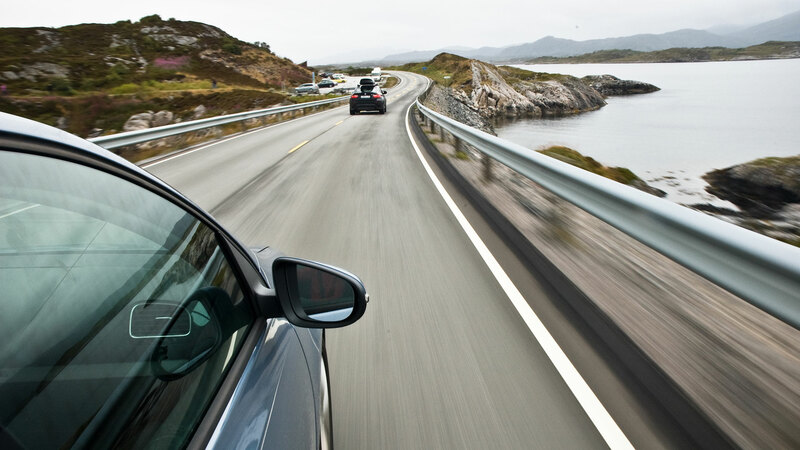 Drive the Fjærlands Road to see Jostedal Glacier, “mainland Europe’s largest icecap”, and visit the Norwegian glacier museum. Then continue via Lake Jølster, Loen and Stryn to Hellesylt, where you will take the ferry on the lovely Geirangerfjord, which can easily be considered the most beautiful fjord in the world. Here you will find magnificent and impressive waterfalls, such as the Seven Sisters and Bridal Veil. 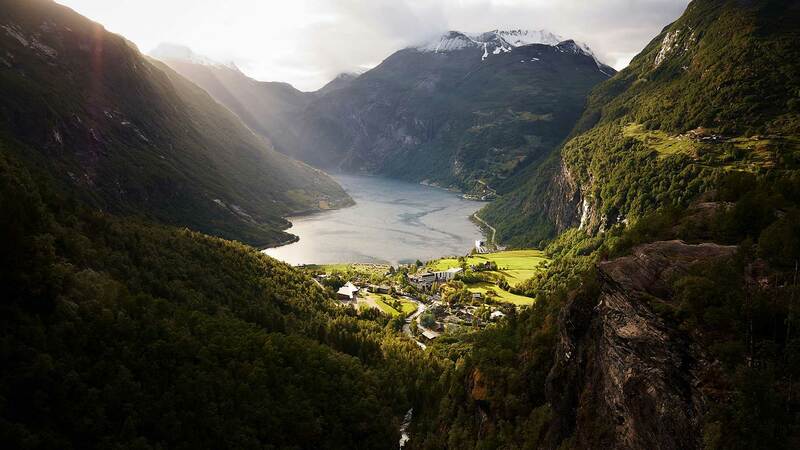 From Geiranger, you will drive up Ørnevegen, or the “Eagles’ highway”, to Eidsdal, where you will take the ferry to Linge. Then head east for the dramatic drive up Trollstigen, the “Troll Ladder”, which is one of the most visited attractions in Norway. 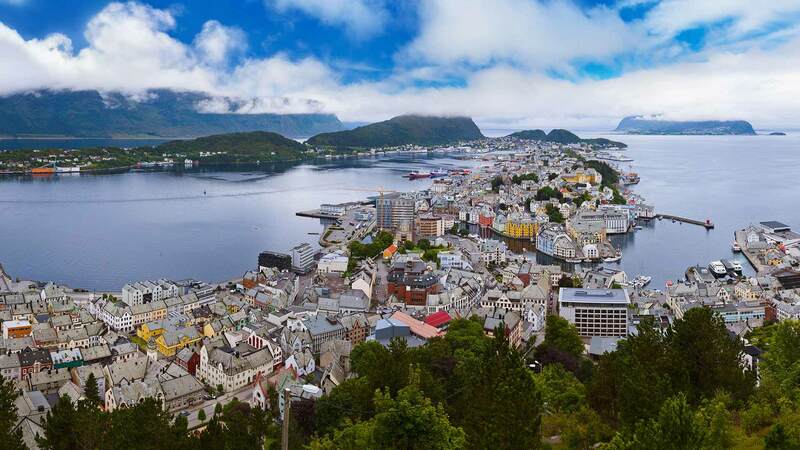 After viewing the high mountains encircling Trollstigen, you will continue to the captivating town of Ålesund. Relax and enjoy the day in the fishing and ferry town of Ålesund. The town was rebuilt in 1904 after a terrible fire, and is therefore distinctively different from any other Norwegian town, with its beautiful Art Nouveau architecture. The myriad of turrets, spires and beautiful ornamentation give the town its distinctive character, which is like something from a fairytale. Here you have the opportunity to visit the Atlantic Sea Park and enjoy the stunning views over the town from Fjellstua. Drive to Vestnes and take the ferry to Molde, then head to the fishing village of Bud, which in the 16th and 17th centuries was the most important trading center between Bergen and Trondheim. You will take the Atlantic Ocean Road, with the vast and boundless ocean on one side, and majestic snow-clad mountain peaks towering on the other. Trondheim is the original capital of Norway, and until the 16th century, Trondheim was known as Nidaros. Here you will find Nidaros Cathedral, which is one of Scandinavia’s largest buildings from the middle ages. Driving distance approx. 378 km / 235 mi. 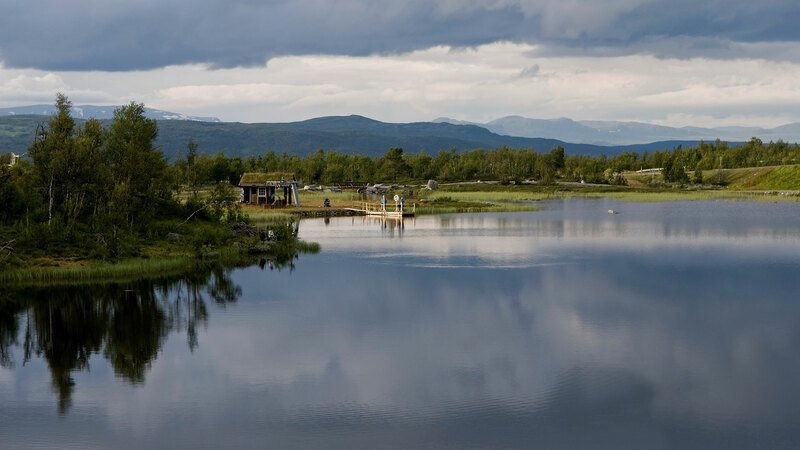 Today you will head southeast, close to the Swedish border, to explore the World Heritage-listed village, Røros. Røros is a beautiful gem with a charming atmosphere, lovely houses and delightful tiny streets and alleys. From Røros, drive south to Lillehammer, the host town of the 1994 Winter Olympics. In Lillehammer, you can visit the Maihaugen open-air museum, the Olympic Museum and/or the Lysgårdsbakken Olympic Arena. 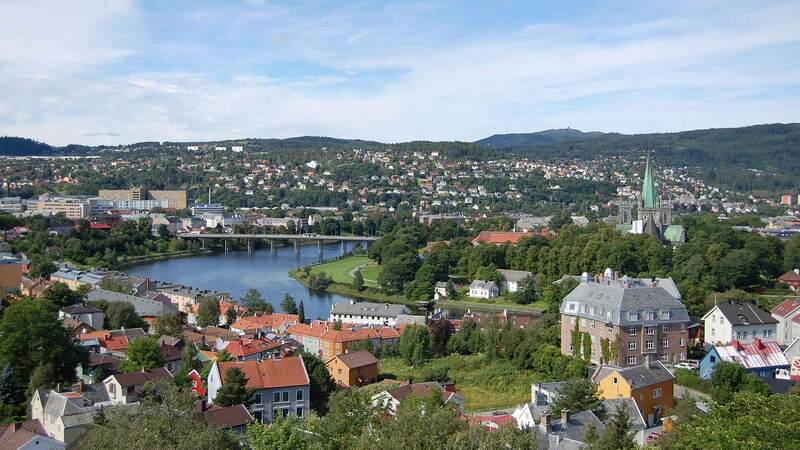 Leave the Olympic village after you have seen and enjoyed all the best Lillehammer has to offer. On you way to Oslo, stop at Hamar to visit Vikingskipet, the impressive ice rink built for the Olympics. Enjoy the rest of the day in the capital. Thanks Helena for a hassle-free booking process and wonderful travel experience. Kolbrun was great and always was very responsive to request or email. I would recommend her service to anyone. Norway Grand Tour was excellent. The hotels booked were wonderful and the service was great. The whole experience with Nordic exceeded expectations! Norway Grand Tour was excellent. The hotels booked were wonderful and the service was great. The whole experience with Nordic exceeded expectations! Our entire experience with Nordic Visitor was very enjoyable. Thank you for all your assistance. We just completed our Drive It Ourselves Tour of Norway. We added 5 extra nights to the standard 12 night tour and found that we needed all of them to see and do all that was available. 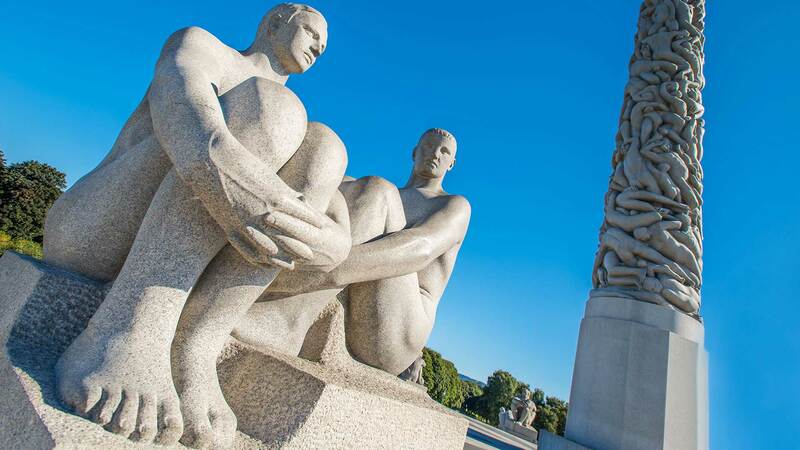 The itinerary was well thought out and gave us a thorough look at central and southern Norway. The rental car was acceptable and Avis upgraded us at no extra cost. All the hotels were above our expectations. We rated all of them 4 or 5 and we have seen a lot of hotels in 26 years of travel. The hotels were all in the center of town and within walking distance of most attractions. The breakfasts were varied and set us up for the whole day. We highly recommend Nordic Visitor. All hotels, meals and rental car were excellent. Kolbrun was excellent with everything, and assisted us with a train from Gothenburg to Copenhagen. I cannot fault anything with our tour experience.